After 6 grueling months and 28 eliminations, baseball is down to two teams to decide who the world champion will be. After winning the National League, the Los Angeles Dodgers will be searching for their first World Series win in nearly 30 years, while the American League champion Houston Astros are searching for the first World Series in franchise history. Both teams are on fire and are looking to bring fireworks to the Fall Classic. It is not very often that the two best teams in each league finally square off to decide a champion. Oftentimes upsets occur, spoiling fan intriguing matchups. However, this year two of the very best teams in the league made it through their playoff matchups and now face off with it all on the line. 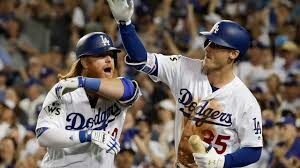 The Dodgers rolled into the playoffs with a league-leading 104 wins during the regular season and secured the top seed in the National League. Led by ace Clayton Kershaw and young and upcoming superstars like Corey Seager and Cody Bellinger, the Dodgers were the odds-on favorites to return to the World Series after a disappointing 2016 NLCS loss to the eventual champion Chicago Cubs. The Dodgers rolled through the National League, sweeping the Arizona Diamondbacks in 3 games in the NLDS and then defeating the Cubs 4 games to 1 in the NLCS to clinch their birth in the World Series. Running the National League with a record of 7-1 had the Dodgers believing no one could stop them on their path to win the Series. However, a team from Houston doesn’t seem too impressed. The Astros in their own right won a very impressive 101 games in the regular season and absolutely dominated the Boston Red Sox in the first round of the playoffs to advance to the ALCS. In the ALCS, they faced off with the red-hot New York Yankees, led by young stars Aaron Judge and Gary Sanchez. After taking a commanding 2-0 series lead against the Yankees, the Astros dropped three games in a row to fall behind 3-2 and became on the brink of elimination. Unfazed by the Yankees’ big bats and young stars, the Astros won the next two games to secure their date with the Dodgers in the World Series. Led by their own young stars Carlos Correa and George Springer along with MVP favorite Jose Altuve, the Astros have the offensive firepower to combat the big bats of Bellinger and Seager and have their own ace in Dallas Keuchel, who looks to even out the big arm of Clayton Kershaw. These two teams seem as evenly matched as any World Series matchup in recent memory and look to provide great, fundamental baseball for all the fans. The first five games of the series have already provided great drama and the rest of the series looks to continue right where things left off. Both of these teams are very deserving to be called champions of baseball, but only one is allowed to. This tension will make for a great and exciting World Series. Will you be watching as these two powers collide for the right to call themselves champions? Senior Joe Giordano is the managing editor. His email is jgiordano@fandm.edu.